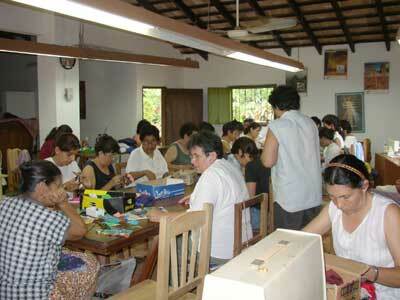 The women of Santa María de Fe make some of the most beautiful hand-sewn craftwork in the country. 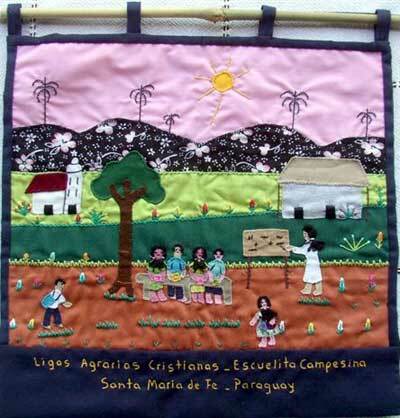 Over a period of more than 20 years, a group of about 25 women (the Taller de Hermandad, or workshop of sisterhood) have been meeting every afternoon to produce this appliqué craftwork, showing traditional scenes from peasant life: cooking over an open fire, feeding the chickens, working in the field, carrying water on the head, riding on horseback, dancing in traditional costume, etc. They also make a series of hangings depicting the flourishing and suppression of the Christian Agrarian Leagues. Each piece is an individual work of art, so the colours, designs and sizes are subject to considerable variation. The modest earnings are shared with a proportion kept back for the purchase of new materials. 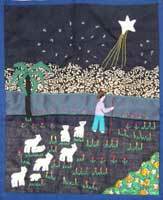 As an example of the variation here are two Nativity hangings - click on the pictures to see some fine detail.